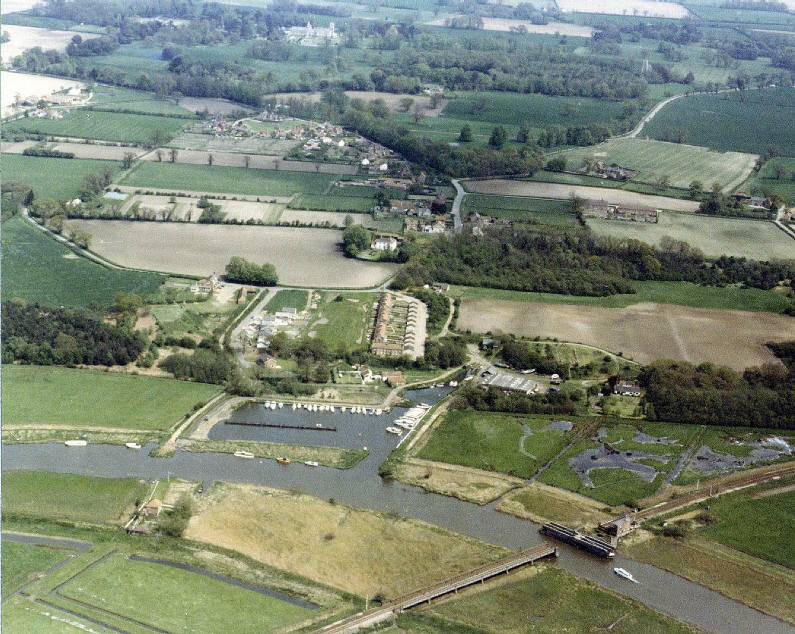 The aerial view above shows the village of Somerleyton in Suffolk with the River Waveney in the foreground, the boundary with Norfolk follows the centreline of the river. The swing-bridge, bottom right, carries the railway laid by Sir Morton Peto’s company from Norwich to Lowestoft that was so important to the development of Lowestoft as a port circa 1845. Somerleyton Hall is shown top centre and the Pergola Lawn where the original prototype Model Hovercraft was tested is to its left and hidden by trees. The Pergola itself is covered with wisteria and a wonderful sight in springtime, please see the Roundel Memorial page. Over 20,000 visitors come to Somerleyton Hall every year and the Hovercraft Column stands beside the B1074 road from St Olaves to Lowestoft that carries about 1,000,000 traffic movements annually. 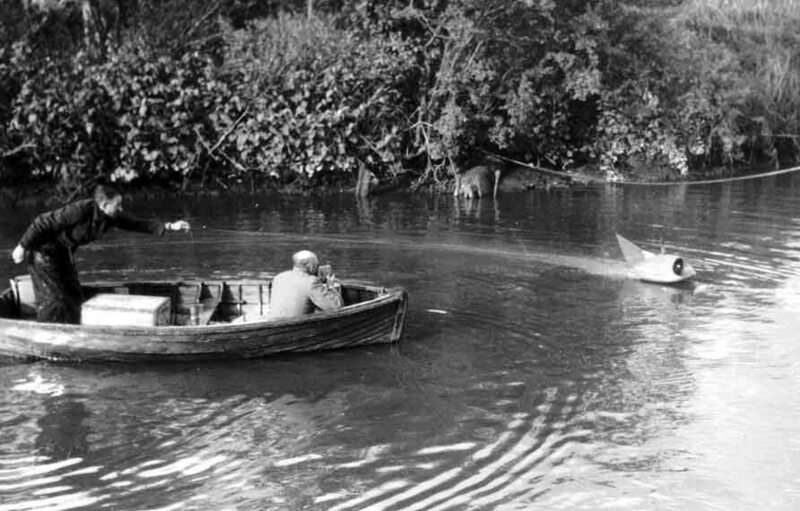 Christopher Cockerell’s earliest work led to the ‘Sidewall’ concept, it began as a purpose built punt with thin side members projecting down into the water by about 70mm. Into the forward end of the bottom a transverse slot was cut, this was the air entry port and in early experiments connected to an industrial vacuum cleaner blower output. The punt was constrained within the tidal flow of the river in such a way that drag could be measured with a spring balance bound into the forward mooring line. Results from this were encouraging and led Christopher to purchase ‘Spray’, a 4.9m (16 ft) motor launch, see Lowestoft College page. Many experiments were then devised to extend the knowledge gained with the ‘Sidewall’ concept, these included a centrifugal air blower driven from the propeller shaft to provide a large volume of air to be trunked over over the bows of the launch. To determine the pressure pattern a series of simple water height gauges were inserted through the bottom. The work was long and arduous and all woven into the requirements of running a working boatyard that relied on the income from its hire fleet to survive. In the picture above a white arrow (lower centre) indicates a wooden building where the earliest Hovercraft design experiments were evaluated between 1953 and 1958. To provide an air supply a 10hp blower was mounted on the end of the building to feed a plenum chamber from which experimental jet profiles were characterised. Doug Rushmer recalls making about forty ‘plug in’ profiles himself. As a result of this work the first Amphibious Hovercraft was designed and a patent was applied for on the 12th December 1955. The picture bottom right dates from 1956/7 shows Sir Christopher making a cine film of the prototype in flight at Somerleyton.